Fruit pastilles or pate de fruit. Not chewy, just soft set jellied sweets. Mmmm. So anyway. This year I had the fanciful idea of making a sheet of fruit pastilles, then cutting them into Christmas tree shapes and putting them in clear front photo bags (I got them in bulk some years ago, which was in part what started this Christmas card project thing as I was determined to find a use for them). This was the idea anyway, making Christmas tree shaped red fruit jellies. In the end, I realised that you’d need an enormous amount of fruit to make the number of fruity Christmas trees we’d need, to enable her to give one to each of her school friends. I’m keen, but not that keen. 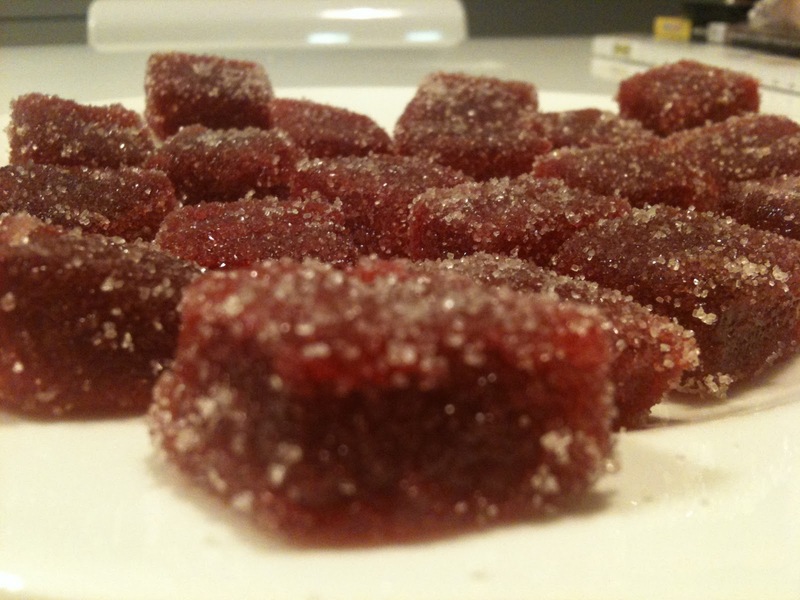 But I made the fruit pastilles anyway and cut them into cubes. If you fancy whiling away half an hour, these make a pretty present (although they don’t really last long) and are intensely fruity (don’t expect Haribo chewiness, these are like fruit jellies, or pate de fruits). I haven’t yet experimented with other fruit but I know people who make them with all sorts: rhubarb, apple, blackberry, mango etc. The only thing I will suggest is that you think of the final colour and use the fruit accordingly. You want something that looks appealing so if you use a wishy washy coloured fruit (apple, say) don’t let it dominate. Personally I think berries are ideal as the main ingredient. Some fruit – you really need to start with about 300g of it to make this worth your while. I used raspberries and apple for the ones here. About 90% raspberries to 10% apple. Put the fruit into a saucepan – chop up if necessary. Obviously that doesn’t apply to berries and if you’re interested I used frozen berries. Squeeze some lemon on them, I squeezed a wedge on my 300g of fruit. It doesn’t have to be precise, as you can probably tell. Cook over a gentle heat until sludgy. If you’re using a mixture of fruit (say, like I did apple and raspberry) you may want to start the harder fruit off first. Cook until mushed up. Towards the end, I help break everything up with a stick blender. Now, take off the heat and sieve into a bowl or other saucepan. Be aware you’ll need to weigh the resulting puree. If you have chickens, you can feed them the sludge left in the sieve. Whatever you’re left with, weigh it and add the same amount of sugar. I think I was left with about 150g of fruit puree so I added 150g of the preserving sugar. Put the puree and sugar in a saucepan, and heat gently. Stir until al the sugar is dissolved, then keep heating gently for about 30mins. Stir occasionally. You know it’s done when it’s thickened and if you take a spoonful out it will dangle off the spoon as you drip it off (this will make sense when you do it) instead of just falling off. You want it to be glutinous. Line a suitable tin/tray with baking parchment. I used the bottom of a loaf tin. It’s easier if you have nice straight sides as they’ll be less to cut off and straighten up later. Put in the fridge and let it cool. Mine were done after about three hours. You can leave it overnight. Turn out onto a chopping board. It should be one solid mass. Tidy up the sides but cutting (I use them as fruit snakes), and cut into cubes or whatever damn hell shape you want. Roll in caster sugar and let them air dry for about an hour to set. Personally I store them in the fridge as they can go a bit sludgy (gosh, I’ve overused that word today). This entry was posted in Birthdays, Children, Confectionery, Presents on November 29, 2011 by Annalisa Barbieri. I ate all of the strip missing just waiting for it to cool. I recently discovered a really lovely, easy, recipe for a rice pudding that is simple but creamy without being laden with too much fat or sugar (on the Waitrose site). Every time we have too much milk in the house I make it. I love having a pudding you can so easily heat up, and yet is so comforting in the house. But I still felt slightly guilty eating it, mostly cos of the pudding rice which is hardly the world’s most nutritious food stuff. And then I thought what would happen if I made it with coarse cut oatmeal, which is low in fibre, said to lower cholesterol and generally add 10 years to your life? This was also borne out of the fact that I love porridge, but often can’t be arsed to make it first thing, especially not the ‘really good’ kind that takes ten minutes of stirring (sorry, not interested in cooking porridge in the microwave). So I tried it with oats – coarse cut oatmeal – and I love it. The incredibly slow cooking makes it taste really creamy, even though it’s only using semi skimmed milk. And the bay leaves and vanilla give it an incredible flavour, without adding calories. I guess you could try to do it with half water/half milk (how I make my porridge on the stove top) and I might try to cut the sugar down a teensy bit more. But I wouldn’t play with this too much, because it’s actually very good. I take a slice of a morning, heat it up in the microwave, add fruit if I want to, or seeds, and in under two minutes you’ve got ace porridge. If you don’t like porridge or rice pudding, there’s little chance you’ll like this. If you do though, give this a try and let me know what you think. Preheat the oven to 150C. Put the milk, vanilla extract and the bay leaves (tear them a little) into a saucepan and heat until almost boiling. Remove from the heat and leave to cool a little. Lightly grease a 1.3L shallow oven proof dish. For ease (until the milk is absorbed this can spill), I put the dish on a baking tray. Scatter the oatmeal, salt and sugar around the dish. Then strain the milk over the top (discard the bay leaves). Cover with foil and bake for one hour. After an hour, remove the foil, stir, cover with the foil again and cook for another 30 mins. After this, remove the foil, sprinkle the almonds on top and then put back into the oven (uncovered, you’re done with the foil now), for another 30 mins. If your oven has a ‘top oven’ function, use it. I use it at this point – for the last half hour – to brown the top. Eat. Enjoy. It’s porridge, but not as you know it. This entry was posted in Breakfast, Pudding and tagged oat pudding, rice pudding on November 21, 2011 by Annalisa Barbieri. Here they are baked and on their sides showing off all their lovely ingredients. My cousin Mary died recently. For her funeral reception, to celebrate the two very distinct sides of her heritage – Italian and English – I made cantuccini and a Bakewell tart. If you think you know cantuccini biscuits as some dry little slab of a biscuit, offered as a consolation prize with your cappuccino, think again. These are crisp but moist and delicious. Even though it was a funeral, I got asked for the recipe and even though my father isn’t known for compliments he declared these “first class”. Here, in memory of Mary, who took me out on my first ‘solo’ trip to the newsagent to buy chocolate, and was the first person I remember ever telling me I was pretty, is the recipe. God bless you Mary, I’ll never forget you. Line a baking sheet with baking parchment. Scrunch it up first and then smooth it out so it lies flat. Cream together the butter and icing sugar. At first this will seem like an impossible task, but believe and it will happen. It’s also a great arm work out. You need to keep going until it’s fluffy and thick and looks like…well, what it is. Icing sugar and butter mixed together. Don’t give up until you get to that bit, this is the only hard-work part of the recipe. Then add the egg, mix up a bit, then the vanilla extract, mix up a bit then the brandy, mix up a bit. Then add the flour and the bicarb, the fennel seeds, nuts and zests. Mix together. You should have a very soft dough. With your hands, man-handle the dough into two log shapes with tapered ends, place on baking paper lined tray and finesse the shape whilst in situ ((I flatten the top a little). These do rise a little so place as far apart as your tray will allow. Don’t worry if it’s only a few cms, but don’t have them touching when they go in as they will fuse together (even that isn’t the end of the world, but it’s not ideal). Cook for 20-25 mins. The tops should be golden but not super brown. Just out of the oven. This is the colour they should be. Slide the whole sheet onto a cooling rack and after about 20mins you can transfer the whole sheet onto a chopping board and slice them into, well, slices. I then transfer them back onto the cooling rack on their sides, so they can cool completely. I find these so easy to make. They keep well and they’re a lovely biscuit to have in. I hope you enjoy them. They also make great presents wrapped in cellophane bags. 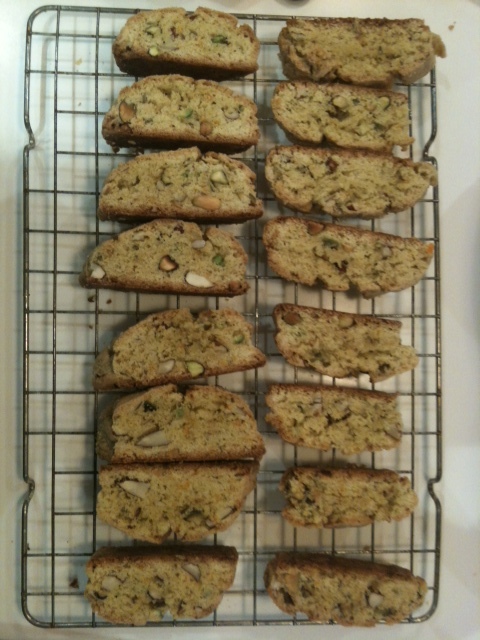 * When I make my own almond milk I use the almond ‘paste’ left over in these biscuits – I use about 80g of the almond paste and then 50g or so of chopped pistachios. Lovely. 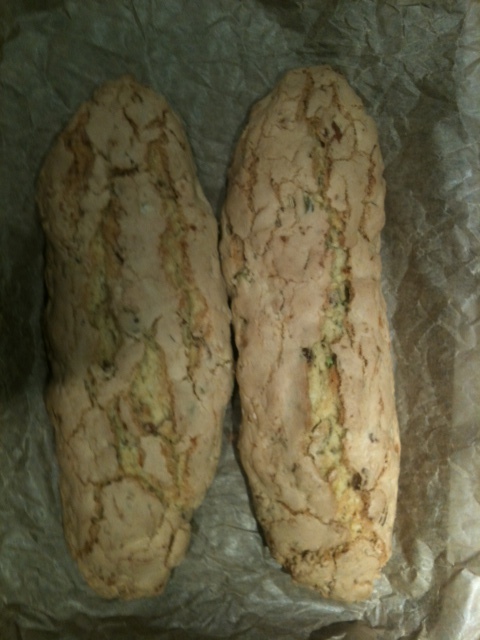 This entry was posted in Biscuits, Teatime and tagged cantuccini on November 15, 2011 by Annalisa Barbieri. 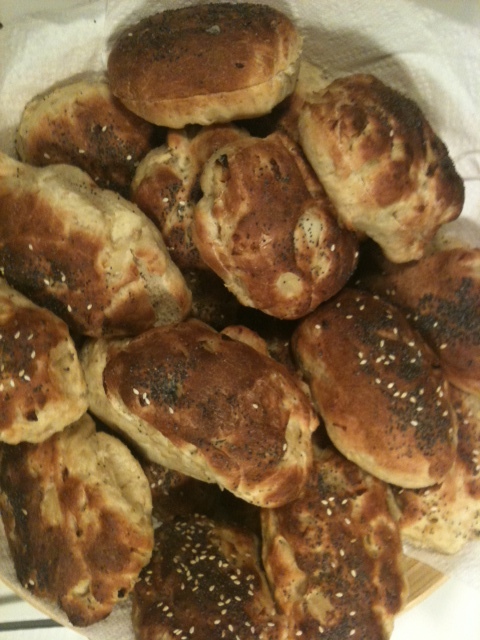 The hole in my bread-making repertoire was, until yesterday, burger-bun shaped. Despite making my own sourdough, bagels, monkey bread, pizza, I hadn’t managed to make (in truth hadn’t ever really tried as I thought it was beyond me) any sort of soft roll to enclose a burger or sausage or hot dog. And any time we bought them in the supermarket, those cotton woolly rolls, I felt more annoyed with myself. I really dislike supermarket bread. Yesterday we had people round and we were going to make spicy butternut squash soup and sausages in a roll. So I determined to finally make my own rolls. I remembered, a while back, Dan Lepard had written about making burger buns (the article and full recipe is here), and the response had been that they were very good. So I gave them a go. Because we had so many people round I doubled the recipe, and I hope Dan will forgive me for reproducing it here, but I just find it easier to have everything in one place. You need: (Dan says this makes about 6-8, I made them smaller and submarine roll shaped and got about 24 out of doubling the mixture). The first thing you do is put the onions, with the oil and a bit of water, into a pan and let them sweat until very soft and translucent, with all of the moisture gone. Leave to cool then tip into a large bowl (with any oil that’s still in the pan). To this add yog, honey and egg. Then add 125ml warm water and the yeast, the flours and salt. Mix together. You will very likely have to add more water – Dan suggests 50ml – it depends on how much moisture is in the onions and how you like your dough to be. I’m quite confident now with a very soft dough. But add the water bit by bit to see how you go. Leave for 10 mins then tip it out onto an oiled surface and knead lightly for 10 seconds. Cover with a bowl or put back in the bowl and cover..and repeat this twice more – leaving it for ten mins then kneading it for ten seconds. After the third knead, leave it covered and undisturbed for one hour. Then take bits off it and start shaping – either large round buns, or long ones, whatever you like. 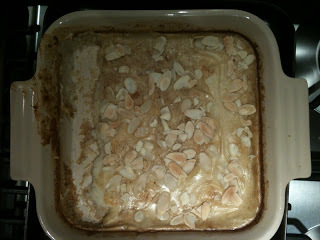 Put on a baking parchment lined tray. Brush with water and sprinkle on poppy seeds (or you know, any seeds you like or no seeds). Cover and leave to rise for about 90 mins – Dan says until they’re 50% risen. In my kitchen (about 21 degrees) this timing was pretty spot on. Put rolls into a preheated oven: 220C. Dan says 15 mins, mine were done in 10 (my oven is very hot), they’re done when they’re just “brown on top”. Really top notch, so easy and delicious. I have frozen some for emergency burger needs. Now, someone gave me a recipe for panettone last year: if it was you please could you let me have it again? This entry was posted in Bread, Buns and tagged burger buns on November 1, 2011 by Annalisa Barbieri. I found this recipe, in amongst various things I’d torn out of a magazine one Christmas past. It answered my question: “should I serve hot chocolate or booze (to the grown ups)?” for a Trick or Treating treasure hunt extravaganza that we were staging in our garden (for the children). It came from Delicious magazine and was written by Laura Santini. I really can’t impress on you how very good it is. Even my partner – a wine expert and hater of mulled wine – got all knee-buckly about it. *if you’ve never grated 100% cocoa chocolate, be warned: it’s very brittle/dry and it goes EVERYWHERE. I wouldn’t personally recommend grating it, but instead, scraping it off with a sharp knife. Put the wine and spices in a saucepan and warm slowly, over a very low heat. Then, add the sugar and stir until dissolved. Add the chocolate and warm through. I used one of those Aerolatte whizzer things to homogenize it as it had a tendency to go a bit ‘speckedly’ with the chocolate. You can either then strain and serve, or strain and chill until you need it (it says it’ll keep for two days), then warm it up again and serve. I really don’t plan to make mulled wine any other way now. And look: 100% cocoa is terrifically good for you, so this is practically a health drink. This entry was posted in Chocolate, Christmas, Drinks, Parties and tagged chocolate, Christmas, Drinks, mulled wine on November 1, 2011 by Annalisa Barbieri.